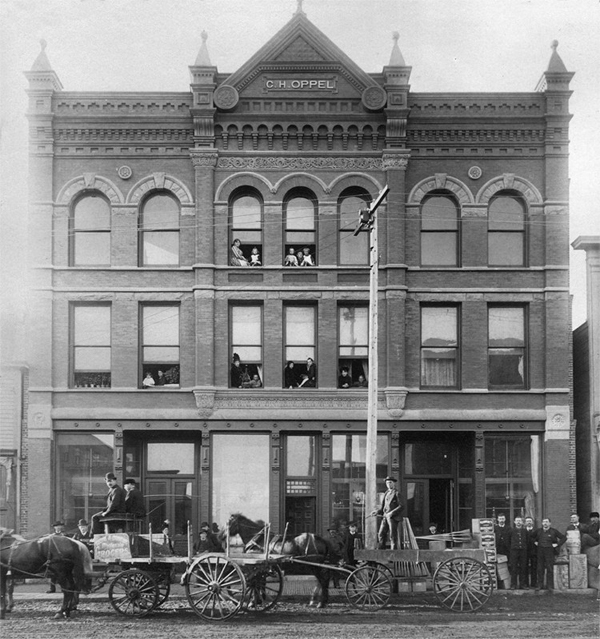 German immigrant Christian H. Oppel and his wife Christina arrived in Duluth in 1870, opening one of the city’s first grocery and dry goods stores. By the 1880s the firm had changed its name to Oppel and Sons with Frank, Herman, and Charles Oppel partnering with their father. 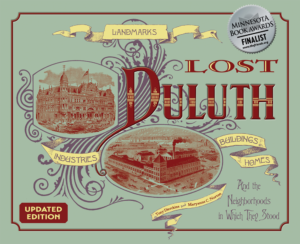 The firm was the first to ship goods into Duluth using the Duluth & Iron Range Railway and they also ran a store in Tower, Minnesota, that dealt in furs and birch bark canoes. The three-story Oppel Building was faced with brick and featured carved stone trim and the name C. H. Oppel carved on the cornice pediment. The main floor store offered men’s and boys’ clothing on one side and groceries on the other. The Oppel family lived on the upper two floors, and they needed them both: the Oppels had eleven children. The Oppel stores closed in 1907 when Christian was eighty years old. (The family later changed the spelling of its last name to “Opal.”) Other businesses occupied the building until its demolition in 1987; its last occupant was the Granada Center adult bookstore. Next door, the Granada Theatre at 109 East Superior Street was also demolished. The site of both buildings now hosts the Fond du Luth Casino parking ramp.